﻿ L'Ametlla de Mar,Tres Cales holiday travel Guide,Costa Dorada. L'Ametlla de Mar on the Costa Dorada of Spain. The quaint fishing village of L'Ametlla de Mar has not been spoilt by high-rise buildings, as have many other Spanish resort towns. L'Ametlla is one of the few remaining traditional fishing villages on the Costa Dorada where the pine trees, not tower blocks, stretch down to the sea. Step back in time amidst the narrow twisting streets of this typical old-world Catalan village. The Costa Dorada has miles of golden sandy beaches which are still relatively un-spoilt by tourism. The area has many popular coastal resorts to explore. This picturesque coast is abundant in terrific beaches, lovely well manicured villages and an interesting history and culture. You can also enjoy an exciting nightlife in many of the larger resorts, and of course, the capital city of Catalonia - Barcelona. The region is quite different from its northern neighbour, the Costa Brava; the coastline is not so rugged, and has endless miles of flat golden sandy beaches. Port Aventura theme park is a must, walking through the five different themed lands brings you to the many rides and attractions, and with the vast array of fantastic live action shows there is enough to keep any age group happy. Aquopolis in La Pineda has a full range of aquatic attractions. The mild climate allows for golf to be enjoyed thoughout the year on the Costa Dorada. The Costa Dorada coastal village of L'Ametlla de Mar. In L'Ametlla will find the traditional way of life enjoyed by the very friendly locals of L'Ametlla for many years. Try the many superb restaurants serving seafood specialties straight from the boats in the harbour of L'Ametlla, enjoy your meal watching the world go by. The harbour at L'Ametlla de Mar has a sailing club with 225 berths. L'Ametlla has it's own beach and life guard service. The beach is ideal for swimming and snorkeling and makes a great sun trap. Nearby places to visit from L'Ametlla: Salou, Sitges, Calafell, Cambrills, Bonmont Golf, Tarragona, Port Aventura and of course Barcelona. One of the greatest attractions of L'Ametlla de Mar has to be it's secluded, uncrowded beaches, some of the best on the Costa Dorada. Les Tres Cales translates as The Three Coves, they are truly beautiful and only a short drive from L'Ametlla de Mar. The fine golden sands and clean shallow waters captivate those who visit year after year. One of these coves, Cala Jordi, has been awarded Blue Flag status as have two other small, un-crowded beaches. Cala Forn beach offers excellent snorkeling especially around the rocky perimeters of the cove where hundreds of varying species of fish can be seen in their natural habitat. L'Ametlla de Mar has one of the cleanest coastlines in Europe. 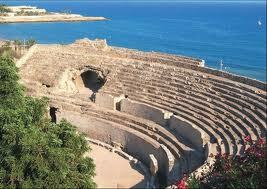 There are many interesting and historical places to visit around the L'Ametlla de Mar and Tres Cales regions. The areas of L'Amettla de Mar and Tres Cales are well known for their scenic coastlines with lovely beaches and creeks and coves to explore. The River Ebro is 15km to the south, famous for it's huge catfish and many other species for the anglers. Those with a love of the outdoors will find l'Ametlla de Mar offers a great variety of landscapes and environments where you can participate in a wide choice of activities. There are many fiestas and special occasions in L'Ametlla de Mar, especially during the summer holiday months. Some of the regular fiestas include: May or June - Corpus Chris - where the village streets are decorated with carpets of flowers. July, Aug - L'Ametlla - Rice and Noodle cooking contests, free open air concerts, displays, etc. July - Tortosa Renaissance Festival, market stalls, street entertainers and dancing. A luxury villa rental, Tres Cales, L'Ametlla de Mar. Villa Jacaranda is conveniently located for visiting the following resorts: Salou, Sitges, Cambrils, Calafell, Port Aventura adventure park, Miravet, the Ebre Delta nature reserve, very popular for bird-watching and fishing the River Ebro, Tarragona, Reus and of course Barcelona. Places to visit from L'Ametlla de Mar. Salou offers a host of Costa Dorada attractions, not least of which are it's beaches. The main beach of white sand is long and wide, shelving gently into the sea providing ideal conditions for young children. A tree-lined promenade is fronted by shops, cafes and restaurants. Salou is packed with lively night-time bars and discos, as dusk falls and you can watch as Salou's famous illuminated fountain springs to life. Sitges, a scenic coastal journey from L'Ametlla, or a day excursion from Barcelona, and want to spend a day or two at a nice beach resort, look no further than Sitges, it is the perfect resort. Sitges has always been a place that has captivated artists, tourists and, in general, visitors from all around the world. For many, the secret lies in Sitges's light and almost 300 sunny days a year to enjoy it's beautiful beaches, as confirmed by the painters, sculptors and writers who made this town their home during the late 19th century. Cambrils is Salou's quieter Costa Dorada resort neighbour, but things are still pretty lively here, especially in peak season. Renowned for its excellent seafood restaurants, Cambrils has a thriving fishing industry and heritage. Cambrils also has a delightful harbour and borders the Parc de Sama just inland. Cambrils has 9 glorious km of beach space with adjoining promenade, popular for both strolling and cycling. Calafell consists of three main areas, the old town which rose around the high medieval castle, the nucleus of Segur and Calafell beach. The area has a mild climate with long, hot summers and short, pleasant winters. If its a beach holiday you want then Calafel has 5km of fine, sandy beach, with clean sand and the water is shallow and warm. The small and scenic town of Hospitalet de L'Infant is charming in its own right. This panoramic town sits near the harbour. The 102 square kilometers of Hospitaletde L' Infant is situated in the Baix Camp region which includes 2 small towns and 3 villages. On the coast- line you will find L'Almadrava, and further into the mountains are the villages of Vandellïs, Masriudoms and Masboquera, all of which give a warm welcome to visitors. Barcelona, sited between the sea and the mountains, has found a formidable balance: a foot in the traditional things and the other in the avant-garde. Barcelona has the reputation of being the most cosmopolitan, modern and avant-garde city in Spain. Barcelona can really boast about its wide variety of parks, ranging from the largest to the smallest, both private and public. The parks and gardens in Barcelona include many that were the former private gardens and parklands of Barcelona's nobility and whether it is just a small square with surrounding trees or a larger open space, they are all peaceful places to relax. There are many bars and restaurants to explore in Tarragona, especially around the port area, near the marina.There are several beaches and coves for a spot of sunbathing or watersport, or, take a look around the the Roman remains including th amphitheatre built in the second century A.D.. The Ebre Delta Nature Reserve, a short drive from L'Ametlla, is world famous for it's wildlife, plant species and it's fauna as well as 95 nesting species of birds. Activities at the Delta include: climbing, sport fishing, canoeing, water-ski, diving, snorkeling, mountain biking, quads, hiking, archery and more. On the left hand side of the Delta you can find Marquesa beach and the lighthouse of Fangar and it's beach along with the beach of Riumar. To cross the side of the river you can use the ferries. A short scenic coastal train ride from L'amettla de Mar will take you to the fabulous city of Barcelona. Plan a full day out as there is much to do and see, all the bars, restaurants, parks, Gaudi architecture and of course, superb shopping. Off-site links - Villa Jacaranda - luxury rental, Tres Cales, L'Ametlla | L'Ametlla restaurants | Port Aventura Website | Port Aventura Golf | Ebre Delta Website | Virtual walk-around Barcelona | Tarragona Guide | Bicycle rental Barcelona.